Investigators have confirmed a fire that destroyed a school in southeast Iowa earlier this month was intentionally set. 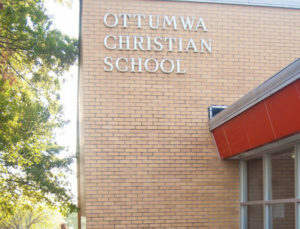 Ottumwa Fire Marshal Cory Benge say firefighters were sent to the Ottumwa Christian School on the night of August 5th. “We knew fairly early in the investigation it was an arson fire, but we were trying to keep the information to ourselves as we conducted the investigation,” Benge said. Investigators were keeping quiet on the cause in hopes it would lead them to the person or persons responsible for the fire. So far, there have been no arrests. “We released it today just to get it out to the public and see if there’s any information out there we’re missing out on,” Benge said. The Arson Hotline number is 1-800-532-1459. There is an award available for information which leads to an arrest. The fire was started inside the school. “There were no ignitable liquids…no gasoline was used in the ignition of the fire,” Benge said. “Basically, it was just ignited with combustibles that were located within the school.” Around 80 K-12 students are enrolled in Ottumwa Christian School. Benge said it’s possible anyone arrested in the case could be charged with a hate crime. “We have not ruled that out…if religion had anything to do with the ignition of the fire,” Benge said. “There were no indications, no graffiti or anything else in the school which would make us believe it was a hate crime, but at this time it cannot be ruled out.” No one was injured in the fire. Ottumwa Christian School students will soon attend classes in an old building (Wildwood Elementary) once used by the Ottumwa Community School District.